Focussing on enhancing employment opportunities for the North East youth, Rajiv Pratap Rudy, Union Ministry of State (I/C), Skill Development & Entrepreneurship, in a high profile meeting in Delhi today met Dr. Neiphrezo Kiditsu, Minister of Labour & Employment (Including Skill Development) and Neiphiu Rio, Member of Parliament and former Chief Minister, Nagaland along with senior officers of skills and labour. The meeting was held to discuss the progress of work in the state of Nagaland under the scheme “Enhancing Skill Development Infrastructure in NE States & Sikkim” and other schemes under skill development mission. The ministers discussed about the current on ground situation of setting up of skill development institutions in Nagaland. Ministers are set to meet again on coming Tuesday, August 8, 2017 to discuss about the skilling projects in length. Frequent meetings with the Nagaland ministers are being organised to ensure smooth delivery of skilling initiatives across North East region in order to enhance employability of the highly potential youth there. Discussing skill development in Nagaland, Shri Rudy said, “We have seen huge potential and dedication in the youth of Nagaland and have already realised that they have great entrepreneurial skills. There is big demand for such youth across the country in varied sectors. We will work closely with the Government of Nagaland to create avenues for growth for the youth of this State. 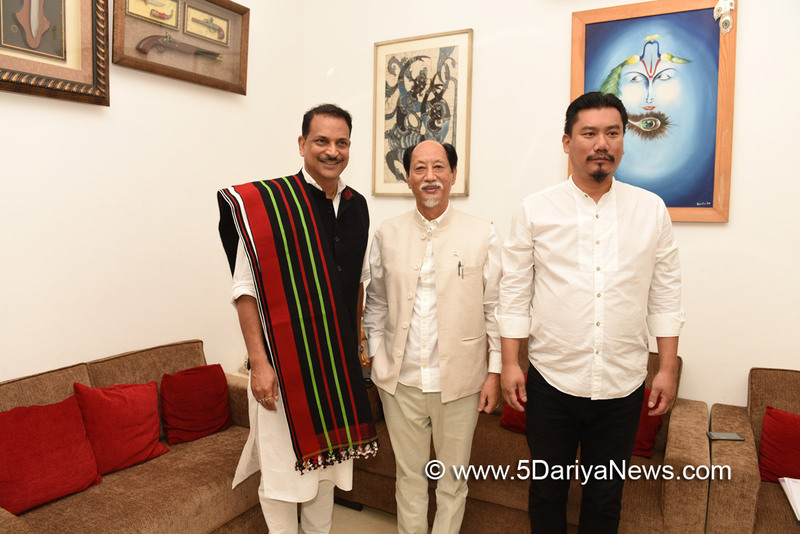 We thank Dr. Neiphrezo Kiditsu and Mr. Neiphiu Rio for their unconditional support which will soon result in setting up of more ITIs in the State and promoting skill development and entrepreneurship.” Shri Rudy stressed on uplifting the condition of ITI’s in Nagaland. He had recently announced that there are two ITIs which are covered under up-gradation plan and five another that are covered under Supplementing Deficient Infrastructure in Nagaland. An amount of Rs. 1149.47 Lakhs has been released for this purpose. Dimapur and Peren are the two ITIs covered under the scheme. Total Rs 788.50 lakh fund has been released for establishment of these 2 new ITIs. There are no ITIs in two districts of Nagaland: Longleng and Kiphire. Hence, the number of new ITIs to be established in Nagaland has been proposed to be revised to 4, compared to 2 earlier. On the proposal on new ITIs, Minister said that his ministry will take step to establish two additional ITIs there.It should be recalled that “Enhancing Skill Development Infrastructure in NE States & Sikkim” scheme was formulated in February 2010 at a total cost of Rs. 57.39 crore. At that time, 20 existing ITIs were covered for up-gradation (introduction of 3 new trades per ITI) and 28 existing ITIs were covered for Supplementing Deficient Infrastructure (Construction of new hostel, boundary wall and supplementing old and obsolete tools and equipment of 3 trades in each ITIs). In 2014, a new component “Establishment of 14 new ITIs” at a cost of Rs 6.22 crore per ITI were introduced and further revised in 2015 for establishment of 22 new ITIs @ Rs. 9.50 crore per ITI.